Andrea Williams reports on the judge overturning the conviction of a prominent pro-life campaigner. The Christian Legal Centre has welcomed a Northern Irish judge's decision to quash the conviction for harassment of a prominent pro-life campaigner. Bernadette Smyth, founder of the Precious Life group, was found guilty on 19th November 2014 of harassing the programme director of Northern Ireland's first private abortion facility. Since the opening of the Marie Stopes Belfast facility, Bernadette and others from Precious Life had gathered outside it in order to educate the public about the true nature of abortion. Bernadette, however, was accused and later convicted of harassing Ms Dawn Purvis who oversaw the facility. In December, Deputy District Judge Chris Holmes ordered Bernadette Smyth to pay £2,000 in compensation to Ms Purvis, to undertake 100 hours of community service and not to go within 20 yards of the abortion facility for a five year period. Yesterday, Judge Gordon Kerr overturned the conviction, ruling that there had been insufficient evidence of harassment. Ms Purvis, a former leader of the Progressive Unionist Party (which has links to loyalist paramilitary groups),claimed that Bernadette Smyth's actions had left her feeling afraid. "Are you not a person with a bit more fortitude than that?" "I was frightened," she replied. The court was also told that one of the incidents wasn't reported by Ms Purvis until a day after it was alleged to have happened. Bernadette's barrister later asked the judge to dismiss the case, which he did, concluding that the evidence did not meet the standard required to secure a conviction. "The sole purpose of our presence outside the Marie Stopes centre in Belfast is to defend human life and reach out with support to mothers with unexpected pregnancies. "We do not harass or intimidate - we lovingly reach out to women with practical, caring solutions which uphold the dignity of both mother and child. Women deserve better than abortion." "We are delighted that Bernadette Smyth has been cleared of the charge against her. She should never have been convicted in the first place. Bernadette Smyth and Precious Life are involved in courageous work to expose the truth about abortion and to speak for unborn children in Northern Ireland and across the UK. We stand with her wholeheartedly. "The spotlight will again be focused on the reality of abortion and the activities of Marie Stopes as a manslaughter case comes to the Old Bailey this Friday." 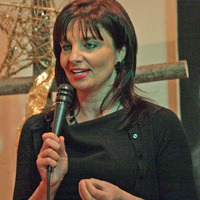 Andrea Minichiello Williams is a Barrister and has been working as a Christian lobbyist in the Legal and Public Policy arena in the United Kingdom for 10 years. She is also Director of the Christian Legal Centre Ltd which is partnered with Christian Concern For Our Nation (CCFON) and is involved in taking a number of high profile Christian freedom and life cases. In the past, Andrea worked as Public Policy Director for the Lawyers' Christian Fellowship, an organisation with a membership of over two thousand lawyers. She was called to the Bar in 1988. Initially she specialised in Criminal and Family Law. Andrea is married with 4 children.